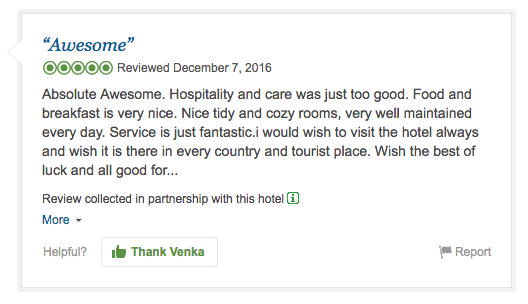 We give you one tool for handling all guest feedback, including both guest surveys and OTA reviews. With this holistic view of your guest satisfaction, we help you solve daily issues instantly and intelligently highlight the most important recurring challenges. Our philosophy is that getting feedback from a thousand guests on a few key parameters is more important than getting feedback from a few guests on a thousand parameters. We integrate with any PMS provider and the post-stay surveys are automatically sent the day after your guests check out. All our surveys fit on one page, and are perfectly matched to your graphical profile. Reputation Management is an integral part of any hotel's success. Responding to feedback and how to compensate dissatisfied guests can vary from case to case, but it might have crucial impact on your success in generating returning guests. We make it a simple task for our customers to categorise how they handle guest issues. Over time the hotel will receive automated information and suggestions of what kind of action we recommend taking. Intelligent actions make for happier guests. Increase number of OTA reviews and boost your online reputation. 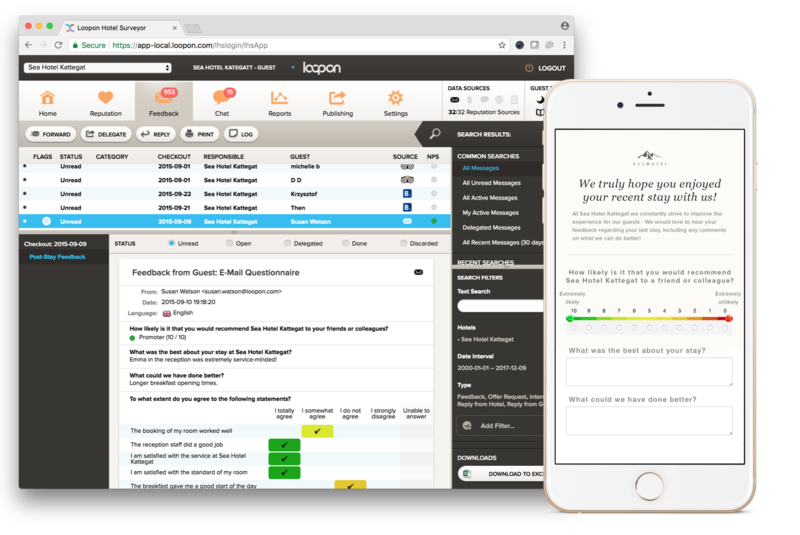 By sending Loopon post-surveys you take advantage of our TripAdvisor integration. Guests can easily post their comments with a simple click after having completed the survey while you see the number of online reviews increase with up to 400%. Benchmarking, NPS & Custom Reports. Benchmarking against your competitors. Analyse your NPS and work towards improving it. 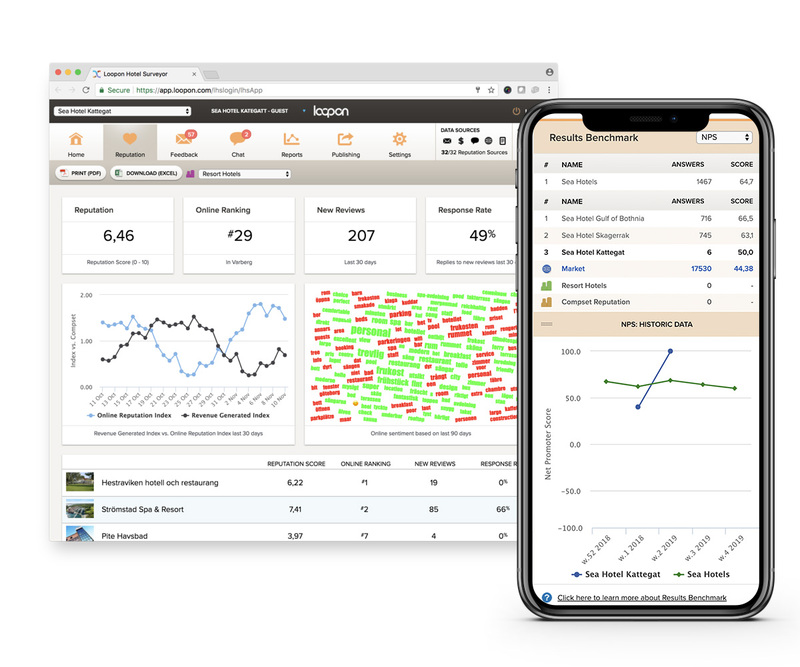 Create custom reports based on an extensive number of variables, allowing your hotel to identify what your guests value the most. Use guest feedback to build a long-term strategy based on the most important variables. We make your employees feel part of the same mission. By delegating and forwarding guest feedback internally to the hotel's employees, they feel accountable. 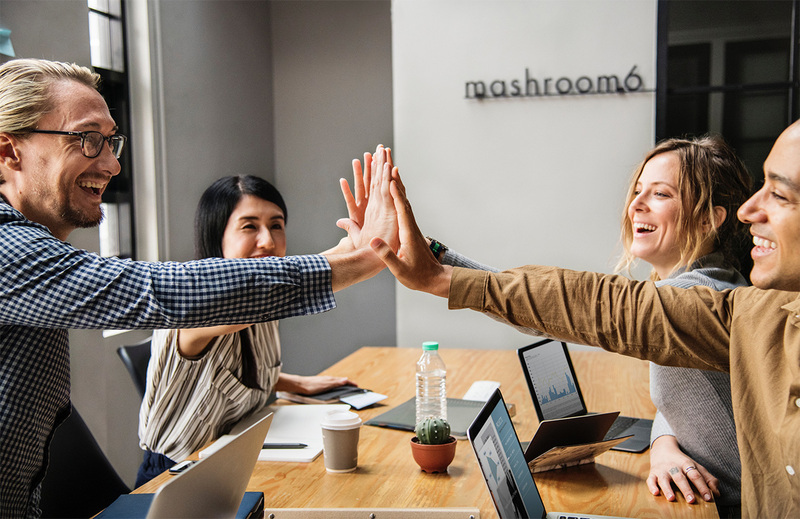 It has never been easier to spot employees that are continuously praised by your guests to make them aware of their work's relevance for the hotel's overall success. 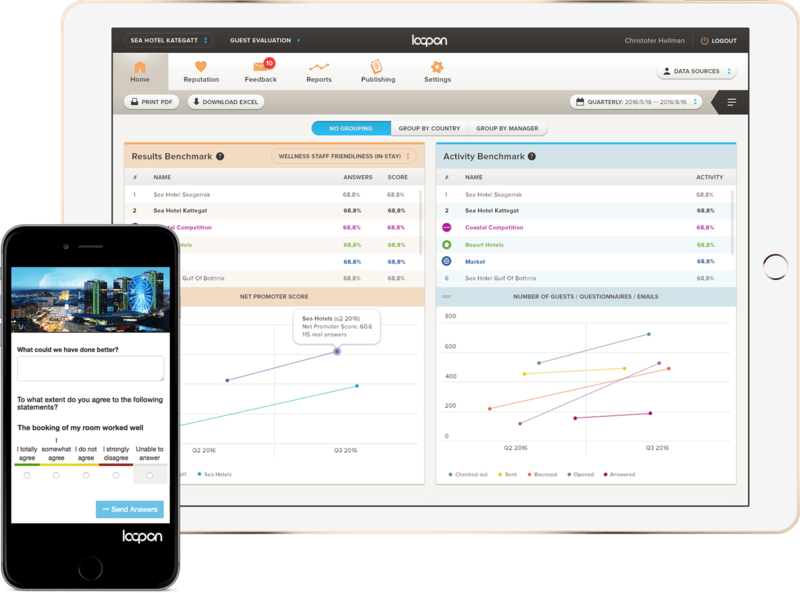 Acknowledging efforts and motivating your team is a natural part of working with Loopon. We build our tools to motivate and inspire our customers. It is not a replacement for strong culture, but a catalyst for a thriving culture with motivated employees. Post-stay is the third part of the Guest Journey. It includes the phase after that the guest has checked out from the hotel. Here the hotel can collect feedback from the stay through customised surveys. The hotel will also be notified of all reviews and feedback from OTAs and can reply and act intelligently. 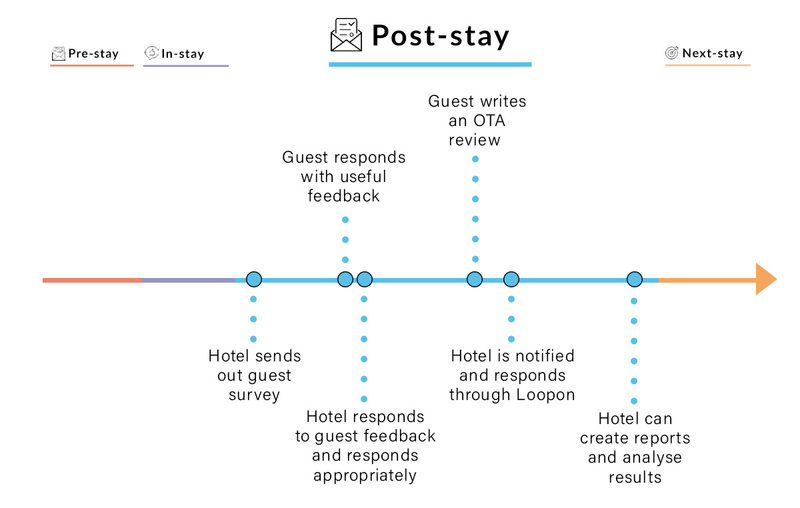 Post-stay allows hotels to react to feedback and improve guest satisfaction by making sure that their guests are heard.